Starting Tuesday, December 5, 2017, you can play “Starbucks for Life” once again! Collect game pieces to win prizes! Six lucky players (five in the United States and one in Canada) will win Starbucks for Life – A free food or drink every day at Starbucks for 30 years! Collect game pieces to win prizes such as bonus stars, ranging from 10 to 125 stars. In the U.S., game players may also win holiday food, beverages, and select merchandise. There are other prizes such as Starbucks for a year or for a month, and you may be able to earn more than 2 game plays in a day by completing challenges. 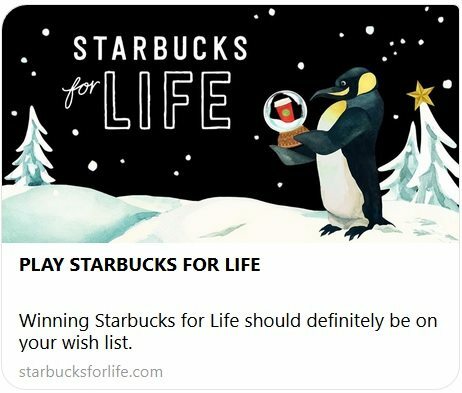 This year’s Starbucks For Life holiday edition game runs from December 5, 2017 through January 8, 2018. Starbucks partners (employees) are not eligible to win prizes. Starbucks for Life first started in 2014 and included in the prize was a beautiful hammered gold Starbucks card. Like last year, go to this website: http://www.StarbucksForLife.com. For the Canadian version of the game, visit www.starbucksforlife.ca. Are you not a Starbucks Rewards member or not yet Gold level rewards? During the month of December, anyone making a purchase at Starbucks with their registered Starbucks card (whether the physical card or on the mobile app) will automatically earn Gold level status for one year! This is part of what Starbucks calls “Project Give Good”. There are other Starbucks Project Give Good events happening. Throughout the month of December, Starbucks “Give Good” squads in red and green aprons will be out and about at community celebrations and events across the country giving away a total of 50,000 $20 Starbucks Cards. The locations and dates of the Starbucks Card giveaways will vary. It’s all about the spirit of giving! Good luck playing Starbucks for Life! If you are a winner of any kind, I want to hear about it! Help Melody Give to the Starbucks Cup Fund. They need to build this into their app like they’ve done the rewards and dashes. It’s great how the app keeps track of all of the steps you need to take for a specific dash and Starbucks should do the same for contests like this one. There is a version for partners too. Yep – got that right! You can actually play for free, the no purchase necessary option. Great way to get extra pieces. I’ve won 85 stars already and just started playing. I agree % every year I think I’m going to win an fall for playing an I always end up with same game pieces over & over!! It’s NO FUN! So do the game pieces you have already obtained disappear after every day? I’m so confused how this game works…. You store the game pieces on the web site. Get three for the specific prize and win. Electronic vs physical pieces is still the same concept. There are a limited numbers of winning pieces (the elusive third piece that completes the row). The winning pieces are randomly distributed and the big wins are randomly timed release. Of course if the user doesn’t have the other two in the set the “winning” piece does no good. I’ve won up to 125 stars before. At least now the notices if you play by entering and not buying come right away. I’ve won 95 Stars and a free Starbucks Mug so far! Love this game. Anybody find the best time to play? Which circle is the last one to get to win starbucks for life? Or is it different for each person? I go to Starbucks on a daily basis and I haven’t even won a single bonus star yet. I’ve completed every challenge except one and I continue to get the same pieces. Ridiculous to get on and have 6 spins and fill up the duplicate row 2 times and still get absolutely nothing! Seems like the game would atleast reward its loyal customers with something! Unfortunately, the chances of you getting the “Starbucks for Life” grand prize is 5 out of however many times anyone gets any reward, which is probably a lot. Haven’t won a single prize, bonus star, or instant gift yet this year, or in 2016. I don’t know if the game is rigged but there are definitely technical issues. Today marks at least the 3rd time that I have landed on a duplicate (like most people, I already have 2 game pieces in each row). Instead of adding another piece to the “Extra Play” row the game stalls and does not add the piece. I should have at least 2 more extra plays. Oh well. Electronic games are great…when they work. I have 2 out of three in every line. I have had 6 duplicates, so I have won a total of two free plays. But it is such a pain to just track down the game, I don’t even care. I have played 100 + times…it’s the same as everyone, final one piece in each row is alluding me. Is anyone winning? It’s got boring now…enough of it. Same issues here. I got 2 if 3 pieces per row early on. I only won 10 free stars all season. Tons of effort for absolutely nothing. A waste of time. Starbucks need to recognize there are lots of loyal customers who play these games and get disenchanted. At least a free water will be nice. Has ANYBODY here (and I know Melody has a lot of unique visitors) actually completed a line of 3 pieces? If the answer is no, I rest my case. I’m not saying “don’t play” as it’s free to play. What I did was, if I made a purchase of course I’ll check the piece and see what I got. And almost every day (if I remembered) I’d get the free play. But no matter. I have 1 or 2 pieces per line. What I am saying is don’t go chasing a prize. Don’t spend more than you normally would to get more game plays. It won’t help. Tim Horton’s here in Canada runs a promo called Roll Up The Rim and idiots all over this country suddenly ramp up their coffee consumption to 5-10 cups a day (at $2+ each) hoping to win a new car or whatever. Guess what they keep winning? “Please play again”, “Free donut”, or “Free small coffee”. Whoopee…. Be very easy for Tim’s to never have a car-winning coffee cup sent out for use. Starbucks could easily fix this game electronically so that NOBODY wins and we’d be none the wiser. Tex, I got 75 bonus stars – the line of 3 pieces. Plus, I got ten extra bonus stars 4 times. And s number of my plays were free plays via email request for pieces. Congratulations, at least SOMEBODY here completed a line. But I’m curious to know how many pieces it took… 3 a day? I always figured anybody who makes just 1 purchase a day has no chance. I actually won Starbucks for a week on this game. The confirmation email I received said my prize will be loaded to my card on March 1st. My mom won about 250 stars total on her account plus a free treat. We mostly used the free entry codes sent to our email as well.